I haven't heard of the Sims FreePlay until I followed a link to the Android Market via The Sims Social. 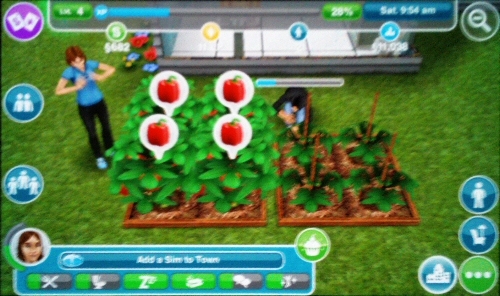 "The Sims on Android? This I must see!" So I downloaded it right away and checked it out, but the initial impression of how good it looked was soon replaced by how strangely it played. 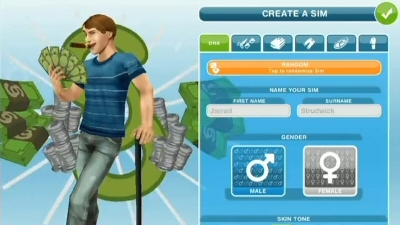 As in all Sims games, we begin by creating a Sim. There are customization options for gender, skin tone, hair color and style, eye color, tops, bottoms, shoes and outfits. Not a massive amount of customization (no facial features, no body type, no age), but still good enough and with graphics that are similar to The Sims 2. You also have several personality traits to pick from, such as Geek, Crazy, Old School, Flirt and more. 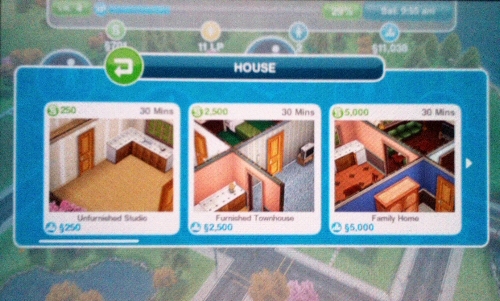 The Sims FreePlay is a free (read: pay for advanced content) version of The Sims in full 3D, with a mission-based progression. The main difference here is that actions take place in real time. 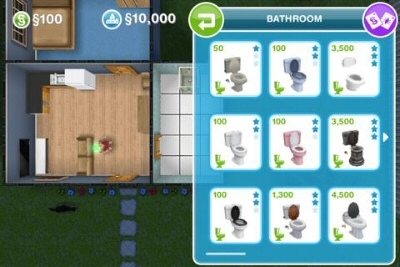 This means that if in real life going to the bathroom to pee would take you 30 seconds, your Sim will take 30 seconds to pee. If your Sim is tired and needs to have a nice long 7-hour sleep, then it will take 7 real-time hours for the Sim to wake up. 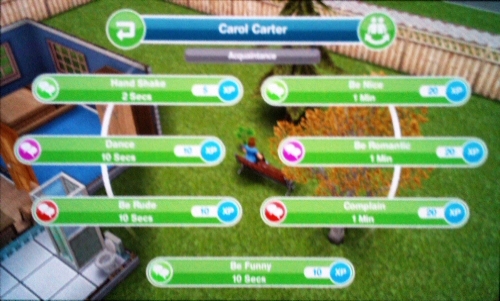 The game also uses your clock, so if it's 9 a.m. for you, it will be 9 a.m. in the Sim's world as well. There is no fast forward button here, but that doesn't mean you have to stop playing while your Sim sleeps, though. One of the first bits of information learned through the tutorial is that it is your goal to populate an empty neighbourhood, and one of the first missions you receive is to create another Sim and move him or her into another lot. So while that Sim sleeps for 7 hours, you can help the another Sim improve their skills, throw a party, play with a pet, or have non-sleeping Sims visit and interact with each other. The controls are fairly simple and responsive. Tapping selects whatever menu or item, dragging moves the camera around, pinching to zoom in or out, twisting fingers to rotate the camera. Sounds weird in writing, but it works really well in practice. 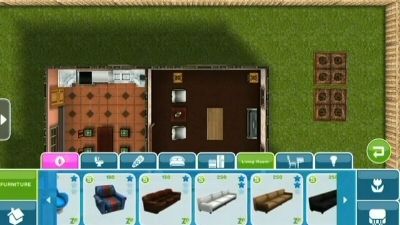 Familiar features such as building rooms, adding wallpaper and flooring, and buying and placing items are still there. 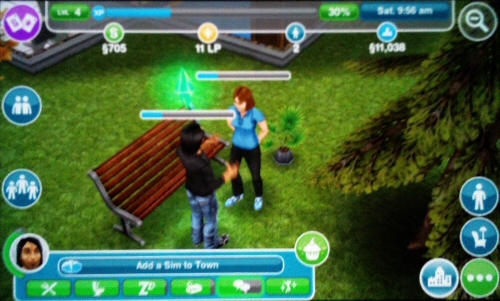 Relationships are still important, and you can call a Sim to another's house so they can interact with each other, by using the "whistle" command. 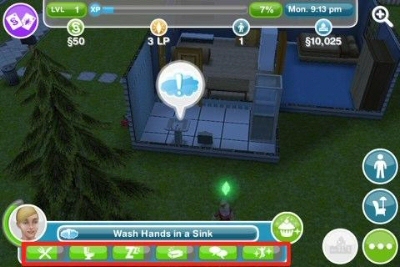 As you add more Sims to your town, more menu options will appear. And as more lots become inhabited, your income will grow since you can collect revenue from them. 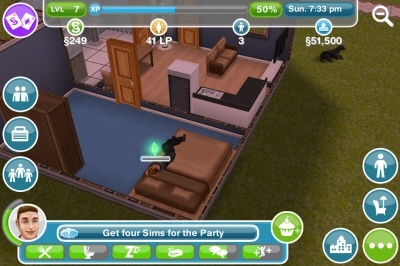 The downside of the game is not being able to cancel actions, so if that Sim is still sleeping, he or she will stay asleep until the time passes. Unless you want to pay for it. Literally. 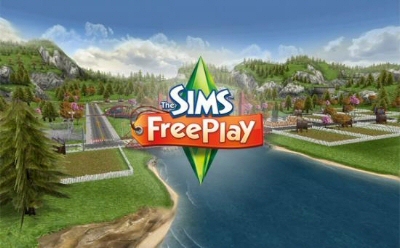 Being a free app nowadays means that there is some kind of micro-transaction system involved, and The Sims FreePlay is no exception. However, it's still possible to play and enjoy it without shelling out the bucks. The alternative is to use LP (LifePoints) to finish whatever your Sim is currently working on, and at least LP are earned by completing missions. Another annoyance is not being able to queue tasks. You can only tell your Sim to do something once he or she has finished whatever ongoing action. But the worst of all is no autonomy whatsoever. Remember how you could set that up and let your Sims unattended for a while, and they would still take care of themselves? Well... I went to work in the morning and didn't check on my original Sim until late that evening... the stupid idiot might as well have died! She had peed herself, was starving and stinking, but still just standing there complaining. With a bathroom right there and a fully-equipped kitchen a step away! Basically, what I thought might be a cool game to play on-the-go and come back later to check on things has very little casual or portable value. Sure, I can multitask and manage several Sims around the neighborhood, or I can try to remember who went to sleep and at what time so I can come back and do something when they wake up. But the fact that they won't move a muscle unless I'm bossing them around makes this virtual world dead when I'm not looking. 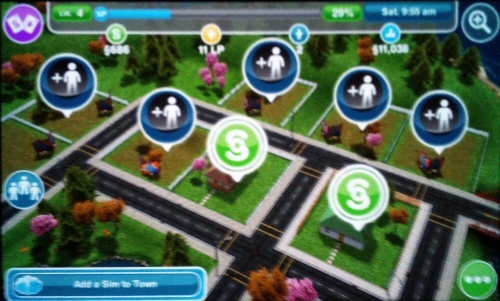 With the ability to queue and interrupt actions, and added Sim-autonomy, The Sims FreePlay would have been a much better game. As it stands, it's just an app I'm carrying around.